"We're constantly transporting, crushing, and removing it from the property and it was a part of our contract that we would do so without allowing the dust to escape." 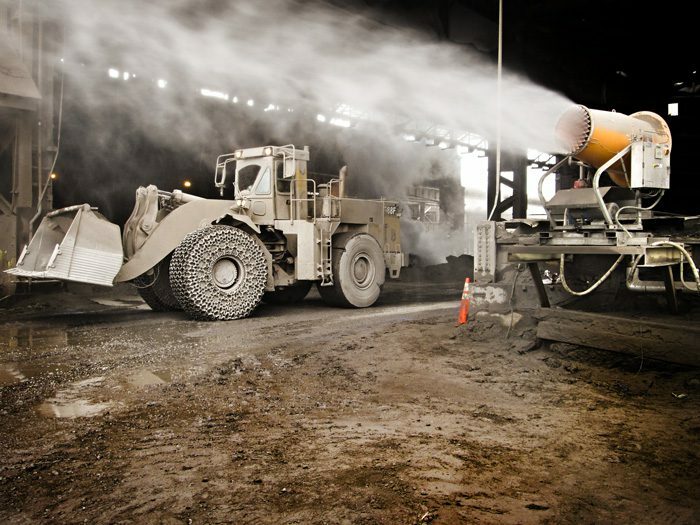 An experienced slag handler uses a high-performance dust control system to prevent the migration of fugitive material from dust-generating activities such as impact crushing and sizing. A staff member recalled a successful trial that had been done with DustBoss equipment to successfully manage fugitive material at another of the firm’s location and the team decided to see the machines in action. In fact, the company had rented three DustBoss machines of different sizes for several months, travelling to company locations across the country and evaluating their effectiveness. Convinced that the technology would effectively contain dust at the Washington plant, they arranged a site visit. A DB-60 at an unrelated slag site. Every application is different. In order to specify the right equipment model, with the most appropriate nozzles, controls and positioning, a site evaluation is critical. At this location, two furnaces discharge slag into pits beneath each one and operations personnel use a front loader to dig and haul to the cooling area. Once the slag reaches a manageable temperature (around 1,000°F), it's processed to remove recoverable metallics and sized into various products for a range of construction applications, as determined by local market needs. The company has specialized in the handling, processing, and marketing of slag products for nearly 100 years, currently recycling more than 10 million tons per year company-wide. "With this mill's production schedule, the slag must be processed continuously so it doesn't build up," the plant manager said. "We're constantly transporting, crushing, and removing it from the property and it was a part of our contract that we would do so without allowing the dust to escape." The network that was developed for this location consists of three DustBoss machines, including one DB-60 built to handle large applications, with a throw of more than 200 feet (60 meters). The rugged design is capable of blanketing as much as 21,000 square feet (11,613 square meters) of area with 50-200 micron droplets, the optimum size for effective particle attraction and dust control in most situations. Complementing the DB-60's coverage at the facility are two DB-30s, a smaller design that outperforms its size, capturing dust particles more effectively than many larger machines. The versatile unit has a 7.5 HP motor that generates 9,200 CFM. Like its bigger cousin, it features a ring of specially-designed nozzles that atomize the water supply to droplets between 50 and 200 microns. The 50-200 micron for droplet size is well suited to most applications. In some cases, the dust particle size may dictate the use of different nozzles or other components to achieve maximum effectiveness. The equipment can be customized for specific conditions. A series of 30 specially-designed nozzles atomize the water, which is then launched by a powerful 25 HP fan that generates 30,000 CFM. Equipped with a 10HP booster pump to increase water pressure as much as 150 PSI from a 2" supply hose, the DB-60 has an adjustable throw angle from 0-50°. The units were mounted on heavy-duty skids for easy transport with a forklift. The ducted fan design of the DB-30 has an adjustable throw angle from 0-50° elevation and a reach of 100 feet (30 meters), delivering exceptional coverage of a 30,000 square foot area (2,787 square meters) from a standard 5/8" garden hose. Because of its compact size, the DB-30 can be an extremely effective option for indoor locations or confined spaces. The machine comes with a 1.5" pre-filter with quick cam release for easy access, and it can be set up to run potable or non-potable water. "As a company, we're always researching new technologies that we can implement to better protect and preserve the land, air and water. The three units are strategically placed to deliver full and complete coverage of the raw slag pile, knocking down dust as it's created and preventing it from escaping through the entrances to the bay doors. This entry was posted in Bulk Material Handling, Crusher, DB-30, DB-60, DustBoss, News, Rentals, Steel / Slag, Stockpile. Bookmark the permalink. Both comments and trackbacks are currently closed.